Five known Istari who were selected by the Valar to travel from the Far West to Middle-Earth in order to oppose Sauron. This was in 1000 of the Third Age. 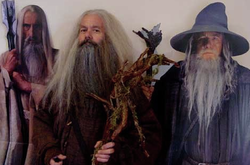 The Istari, or wizards, were: Saruman the White (Leader of the wizards who later joined with Sauron), Gandalf the Grey (good wizard who successfully complete his task), Radagast the Brown (wizard associated with nature) and Alatar and Pallando (little-known blue wizards). You may notice that each wizard had a color, and they also had their own unique staff, or wand. Wizards were generally good and wise, though Saruman turned bad and was a fool. Alatar and Pallando disappeared in the East. Radagast gave up opposing Sauron and decided to live with Birds and Beasts. It was then left to Gandalf to complete the task. He formed a white council of the wisest of all beings. He opposed Sauron through much stress. He formed a Fellowship to destroy Sauron's evil Ring of Power. He even died trying, but then came back. He alone was released into the Far West. As for the others, Saruman attempted to conquer the Shire and failed, and Radagast was never really ever heard from again.